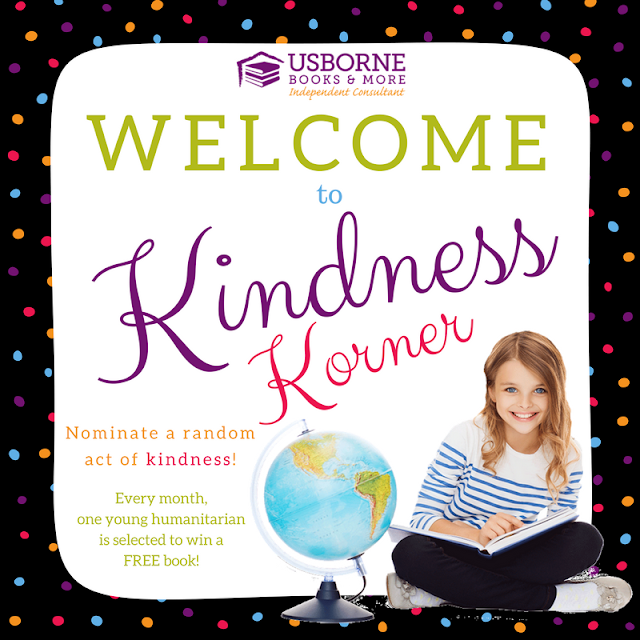 Kindness Korner is a special place for my VIP Group and customers that I created to nominate acts of kindness done by our families, friends, neighbors, etc. and every month I will choose one of our young humanitarians to receive a free book as a special thank you from me for their kindness and efforts to make the world a better place. This was inspired by a special "Ellen" segment in which two high school girls found out one of their friends was being bullied and decided to give their crown to her if they won the title of Homecoming Queen. One of the girls did win and presented this sweet girl her crown during the football game. Ellen celebrated this selfless act by rewarding each one of them scholarships and named each one of them Honorary Homecoming Queens on her show. I was in tears after I saw this and decided I wanted to do something similar to reward the unsung heroes who silently perform small acts of kindness every day. I created this graphic and posted it on my website and in my VIP Group. Feel free to use this information for your VIP Groups, please personalize it and add some YOU to it so it's not word for word. Thank you! If you know of someone who has done an unselfish act of service for someone else that you think would love to be surprised by a fun book, please fill out this form and I will contact the winner at the end of the month - Kindness Korner Nomination.